The Los Angeles Opera’s revival production of Mozart’s youthful opera Abduction from the Seraglio forgoes the usual Turkish mosque and Muslim motifs. In their stead, we are onboard the Orient Express from Istanbul to Paris, circa 1920. 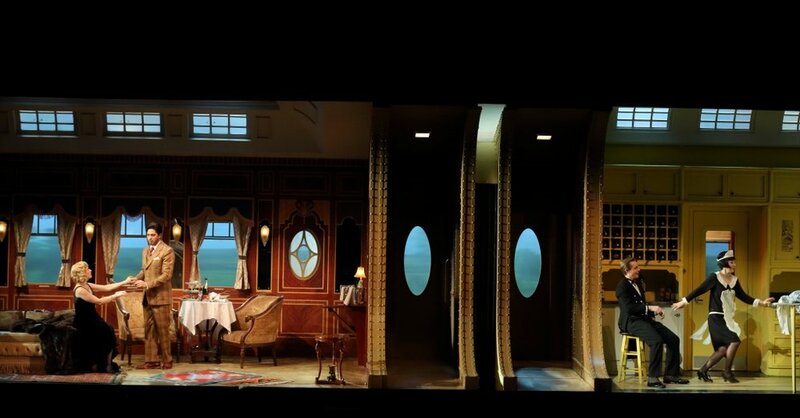 The lavishly-appointed cabins are seen in a cut-away view, with compartment walls separating the singers during the ensembles, often with hilarious results. I am thinking the scene in Act III, in which Pedrillo lulls the Turkish guards to sleep with his ukulele, while Belmonte steals in and out of the other compartment in preparation for their escape. The staging of Abduction is a timely one, in light of the current tensions between the Christian and the Muslim worlds. When Pedrillo, a Christian, timidly asks Osmin, a Muslim, “Can’t we be friends?” (in a modified version of Andrew Porter’s original English translation), one senses that he is making as much a personal statement as a political one. James Robinson’s stage direction was natural and unobtrusive, adding human interests to the often static numbers and moving the drama along at a clip pace. The handsome young cast were generally topnotch. Spanish tenor Joel Prieto sang with great ardor and nobility as the lovelorn Belmonte. His betrothed, Konstanze, was sung and acted lovingly by American soprano Sally Matthews, who rejected all of Pasha Selim’s advances and lavish gifts and delivered some poignant singing in her two arias ‘Ach ich liebte’ and ‘Traurigkeit’, as well as her impassioned showstopper ‘Martern aller Arten’ (a sinfonia concertante for soprano and four instruments), showing off her considerable vocal bravura skills while also exposing her weak low notes for this particular number. The delightful, sparkly duo of servants were sung by soprano So Young Park and tenor Brenton Ryan as Blonde and Pedrillo, both alumni of the Domingo-Colburn-Stein Young Artist Program. Pasha Selim is a speaking role that calls for an actor of great imagination and charisma, and finds him in Shakespearean actor Hamish Linklater, who played the role like a man of enlightenment that he is, without resorting to ranting and shouting of other lesser Pashas. But the audience favorite of the evening was basso cantante Morris Robinson’s lovable buffoon Osmin, the Pasha’s faithful overseer who threatens “a hundred deaths” on the hapless Pedrillo and yet harbors secret desires for Western liquors and women. In addition to looking the part, Robinson also had the rare vocal chops to sustain a low D for a full eight measures in the Act 3 aria, ‘O, wie will ich triumphieren’). In Osmin’s Act 1 rage aria, ‘Solche hergelaufne Laffen’, Robinson ranted violently about Pedrillo while keeping it musical and within bounds of good taste – per Mozart’s letter to père Leopold dated 9/26/1781, “a man in such a violent rage oversteps all the bounds of order…but the music must never offend the ear and should always give pleasure to the listener.” We eager await Robinson’s return as Sparafucile in next season’s Rigoletto. L.A. Opera’s Music Director since 2006, James Conlon not only gave a highly stimulating pre-opera talk, but also directed a stylish and lively Abduction, balancing Mozart’s comical Turkish elements with the soft tender moments between the lovers. The Los Angeles Opera Chorus sang magnificently in their short but vital Turkish choruses.